Continuing my day of "new" favorites, these are some recent purchases, that I find myself reaching for often. P.S. Thank you all so much for the kinds words during my convalescence LOL! I feel better, but still look like crap, so I am sparing you today - I don't know what I was thinking posting my face this past week. LOL!! 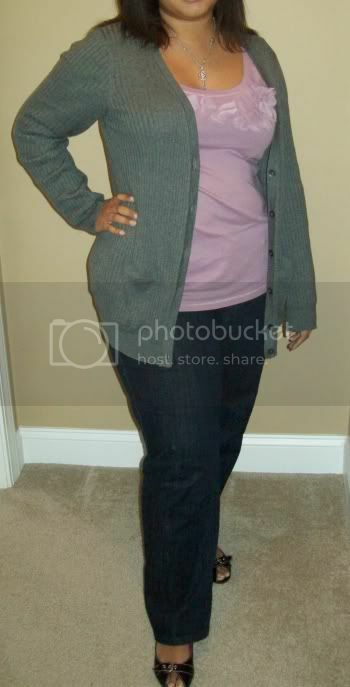 I always love the cardigans you wear! I want them all, lol. The pendant is cute; I love QVC and I also love anything with the Fleur De Lis. I'm obsessed with Paris and will go there some day. If you make it before I do, be sure to bring back a souvenir for me! The fleur de lis key is beautiful! The petal top is fun. I went to Paris briefly while I was studying in London, but I'd love to go back and spend some more time there. I'd also love to improve my French. It's pretty weak. oh, i have my own pitiful story. i was all set to go to paris last year,but 2 days before i was due to leave, i became ill and had to have emergency surgery!!!! hopefully, we'll get another chance. you're wearing one of my favorites. i just adore your necklace!!! I'm glad to hear you are feeling better, Bianca. 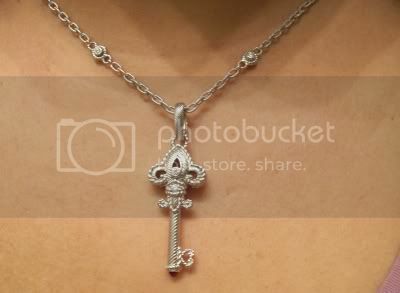 I love the fleur de lis key necklace! Beautiful and intricate. That's a sweet story about your French teacher. I hope you'll make it to France some day. My family went for a little over 3 weeks when I was in high school, despite the fact that (at the time) none of us had taken French lessons, and it was a wonderful experience. I'd love to return some day. Paris was a great way to wrap up the trip, but really my favorite part was traveling to different regions in the country and seeing how each city really had its own unique vibe. One of my favorite things about reading all of the blogs that I do is all of the wonderful stories people have to share-- yours is wonderful! Even better that such a beautiful symbol brings back such memories for you! Can I tell I am love-love-loving that necklace?? Because I so am :) You look fabulous! I'm glad you're feeling better.You looked lovely during the week. Amanda - you are welcome pretty girl - thanks for stopping by! Gina - Sounds wonderful to study in London and visit Paris - you will have to tell us about that one day. Patina - I am so sad to hear about that! I hope you make it there someday soon. Kari - that sounds wonderful. Culture immersion is always a great way to learn! Mary - thank you! I appreciate it :-) I never know if people care about the stories or not LOL! Jess - :-) Haha. Oh by the way - I have been commenting on your blog a bunch and none of them are showing up - I dunno what up with that? ?